Buried deep in a House technical corrections bill unveiled yesterday is a provision to allow staff of for-profit charter school management groups to serve on the boards of the public charters schools that contract with them. The technical corrections bill unveiled Thursday is supposed to be way for lawmakers to tweak laws but it often becomes an under-the-radar way to push through controversial changes and “asks” from powerful lobbying groups. The one-sentence addition to charter school rules would prohibit the State Board of Education from dictating who can and can’t sit on the board of the publicly-funded charter schools. That issue popped up last year when the N.C. Department of Public Instruction told a politically-connected charter school operator he couldn’t sit on the board of the school he works for. 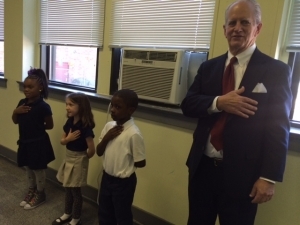 Baker Mitchell, who founded Charter Day School in Brunswick County, owns an education management company called Roger Bacon Academy that is contracted to run four charter schools in the southeastern part of the state. Last year, the State Board of Education told Mitchell that neither he nor other Roger Bacon staff could be voting board members of the charter schools, a decision that bothered both Mitchell and the charter school board members. The charter school’s board protested the ban, and filed a grievance with the N.C. Office of Administrative Hearings challenging the education department’s decision. That legal suit was dropped on July 16, just eight days before the proposed change emerged in the House Technical Corrections Bill, according to the administrative hearings office. Mitchell is an outspoken proponent of applying free-market principles to charter schools and has given generously to the campaigns of several key Republican lawmakers. He also sits on the charter school advisory board which makes recommendations on the applications of new charter schools. Mitchell and his Roger Bacon Academy charter schools have been sources of controversy in New Hanover and Brunswick counties, and public school leaders have questioned the millions the public charter schools pay to Mitchell to run the schools and rent buildings. Mitchell, in turn, has held up favorable test scores from his schools’ students, and said that he provides a needed service that saves taxpayers money in the end. The changes, if adopted, would could open up the doors for more influences on individual charters schools from large, national for-profit charter school chains, like National Heritage Academies and the Wall Street-run K12, Inc. that has lobbied (with no success yet) for several years to open up a statewide online charter school. The charter school change is far from the only controversial change tucked in at the last minute to the 55-page technical corrections bill. Other policy changes in the technical correction bill would do away with the state’s child fatality task force (click here to read an WRAL story). The Associated Press reported here on a long list of proposed changes, including a move to prevent court officials from filing information to block or delay gun purchases by those with documented mental health issues and domestic violence histories. The technical corrections bill is up for a vote on the House floor this morning, check back here for updates. UPDATE: The bill passed the House after rules were waived to have a third reading of the bill. It now moves on to the Senate. A separate charter school bill heard today would also pass anti-discrimination language for charter schools that do not include protections for gay, lesbian, bisexual or transgender students or staff.